From Marco Wilms, a seasoned documentary filmmaker and true revolutionary in both spirit and action, comes this highly kinetic, explosively colorful account of rebellion in progress. Its entry point is street art, or graffiti, yet its scope is much larger, bringing to light numerous forms of artistic expression as they are employed engagingly to bring about change. 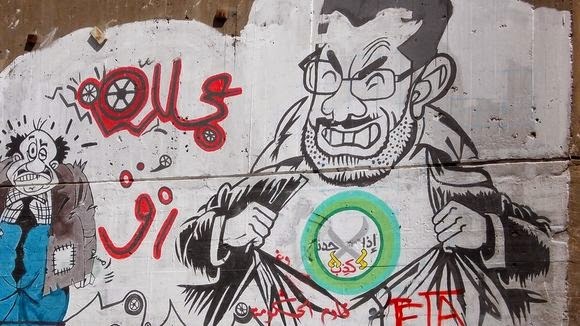 Beginning with a view of Egypt’s struggle-ridden Tahrir Square, a narrator relates the current situation of citizens’ resistance to the Islamic Brotherhood Party to a history thousands of years old filled with cultural battles, some of the earliest of which have been memorialized by visual artists on temple walls. 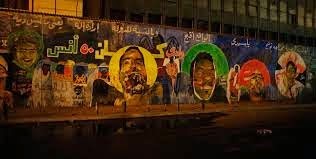 The struggle is shown to go through phases, from upbeat rallies where those hoping too overthrow Morsi’s oppressive regime appear to sing out en masse, to horrifyingly violent skirmishes with both police and party supporters, which Wilms camera in hand, throws himself right into the middle of. We see Hamed Abdel-Samad, a writer and political theorist, engaged in a sudden conflict with a group of men taking issue with he questioning of religion depicted on his shirt. It is the street art that stands our front and center, which we see created during risky nighttime gambits. 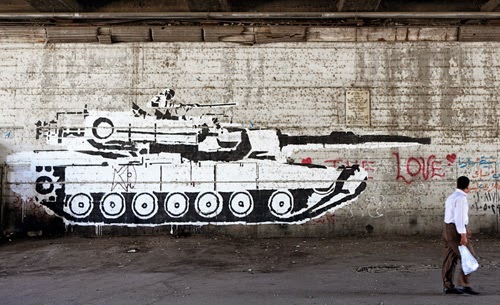 Graphic designer Ganzeer’s clear-cut propaganda style imagery, reminiscent, in part, of Shepard Fairey or Banksy, offers an ‘alternative propaganda to that of the government.’ Then there are the constantly changing paintings on Mohamed Mamoud street, an area known for being the site of brutal conflicts between protestors and police where many young individuals have met tragic ends. Ammar introduces his work that was made to memorialize these victims. We later see paintings on these walls to express new visions and communicate more urgent messages, in one very striking visual, the public displays depict the graphic disfiguration of some of the unfortunate revolutionaries. Wilms’ vision does not avoid complications, showing different facets of this period of unrest. A Youtube video is shown of a group taking credit for destroying one of Ganzeer’s murals. There is also anti-protest propaganda made by a supporter of a religious known as the Salafist party. Interesting too is a shift in focus to look at another musician, an electro punk artist known as Bosaina. She is less interested in direct political opposition, taking more personal issues with the censorship of self she has experienced throughout her life, and as a result carrying on a kind of personal artistic protest by challenging a stultifying gender identity she feels saddled with. Wilms captures the frenetic exchange of these many ideas, conflicts, and modes of expression in exciting fashion, a crash course introduction to a very real revolution. One that will doubtlessly trigger strong urges to learn more about its dynamic subjects. 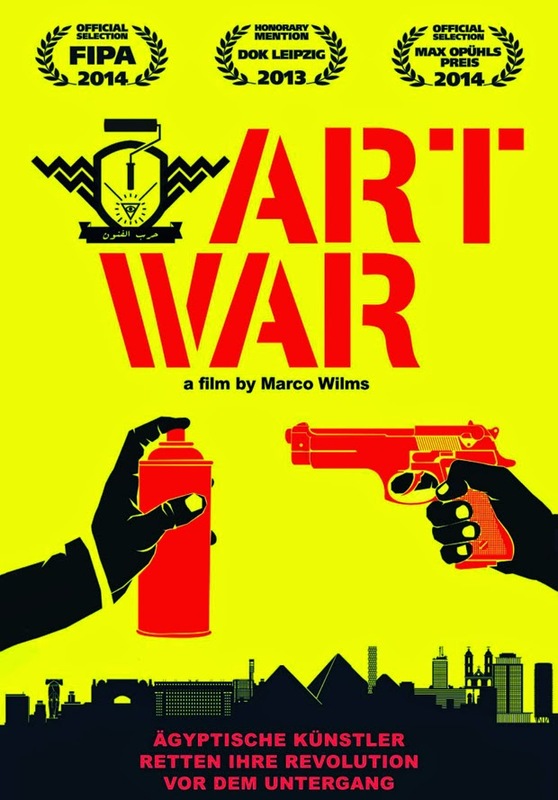 ART WAR plays as part of the 2014 Kino Festival of German Films in New York on Monday, June 16 at 4 PM at the Quad Cinema. Visit the website for more details or to buy tickets.